The old-school egg-in-a-hole format is cute, but why cut a hole in a piece of bread when there are skinny bagels in the world? 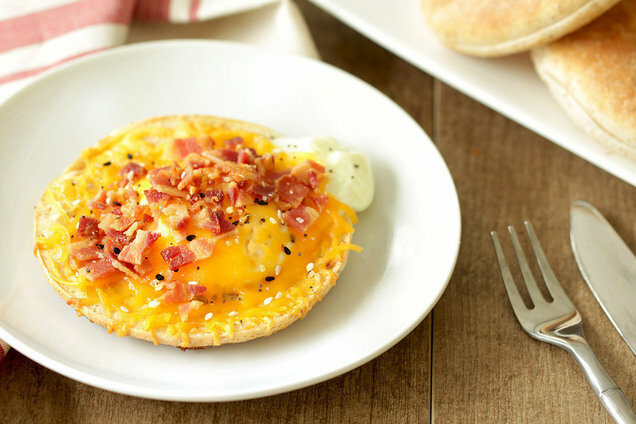 Our spin on the classic morning meal is loaded with bacon and cheese, yet it has only 200 calories! Split bagel into halves, and lightly toast. Lay halves on the baking sheet, cut side up. Carefully crack an egg into the center of each bagel half. Sprinkle with salt and pepper. Top bagel halves with cheese. Bake until egg whites have set and cheese has melted, about 4 minutes. Chop or crumble bacon, and sprinkle over bagel halves. Hungry for More Healthy Egg Breakfasts? Today, September 26th, is National Pancake Day. No, this isn't the day where IHOP gives out freebies. (That’s in March.) You can do better anyway with these two recipes! This recipe serves two; click "Send to a Friend" to see who wants the other half!